his fish, about 20 cm. has an elongated body of brownish red color, with 7 to 9 vertical, thick, darker bands on the sides, which are divided by a white to yellowish longitudinal line. Its belly is also white to yellowish. Lives on rocky bottoms, from the surface to great depths, guarding jealously its territory. This fish is quite courageous, not being afraid of beings as big as a diver. Anyway, when it feels threatened, it hides in a hole of the rocks it lives on. Preys on crustaceans and small fishes. It is quite lonely and it defends its territory from its neighbourghs of the same species. Can be observed in couples in the reproductive period, from May to August. 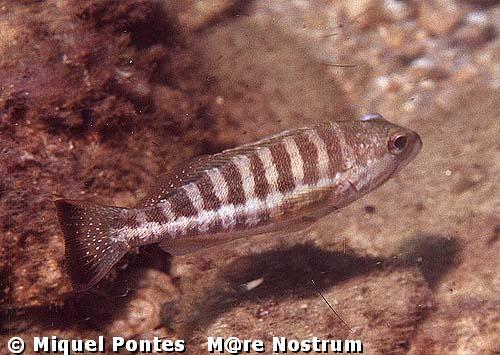 This is a really hermafrodite fish, so the sperm and the ovums mature simultaneously, so intern fecundation is possible. 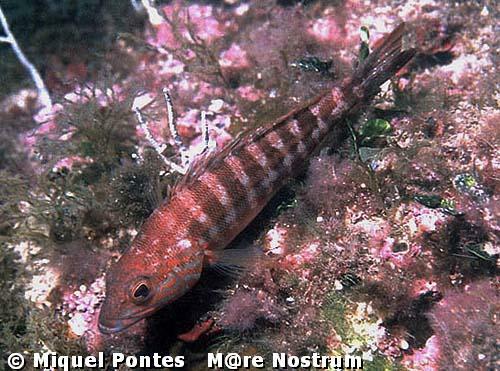 Because of overfishing, only small specimen are found in coastal waters.